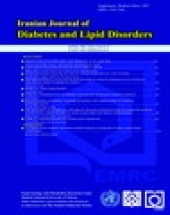 Iranian Journal of Diabetes and Lipid Disorders (IJDLD) is a quarterly published since 2001 in Persian together with English abstracts. The main scope of this journal is to publish original basic and clinical studies in the special field of diabetes and lipid disorders. The members of the editorial board of IJDLD are specialists in the fields of endocrinology and biochemistry selected on the basis of their research background from different parts of the country as well as some international authorities in the relevant fields. Based on IJDLD policy, all submitted manuscripts are initially evaluated in editorial sessions to find peer reviewers’ in related subjects. Final decision about acceptance of a manuscript for publication in IJDLD will be made in the editorial sessions based reviewers comments, author’s responses or revisions. We believe that there are only a few international journals with the same scope as IJDLD and The Endocrinology & Metabolism Research Center (EMRC) as publisher of this journal is one of the most active research centers of the country. IJDLD is the first peer-reviewed scientific journal of our country dedicated to the fields of diabetes and lipid disorders.